BETTER PRODUCTION MMS JULY 2018 114 mmsonline.com GE AR PRODUCTION FINISHES FOR IRON, STEEL & ALUMINUM FREE SAMPLE FINISHING – Send parts & we test and provide recommendations. www.birchwoodtechnologies.com TOLL FREE 1.800.328.6156 TRU TEMP ® black oxide for iron and steel. 30 minute process operates at 200 o F and creates a black magnetite finish. 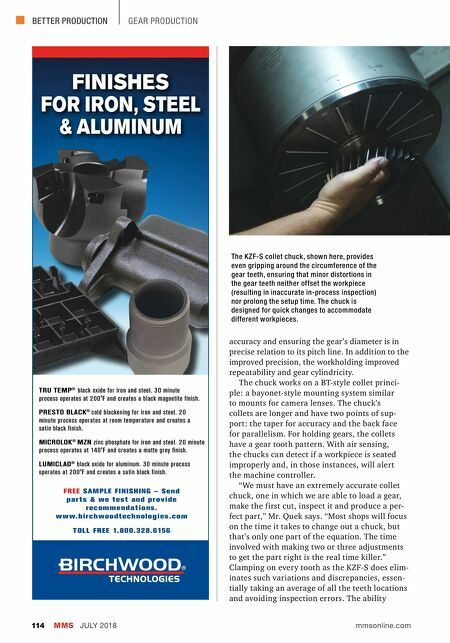 PRESTO BLACK ® cold blackening for iron and steel. 20 minute process operates at room temperature and creates a satin black finish. MICROLOK ® MZN zinc phosphate for iron and steel. 20 minute process operates at 140 o F and creates a matte grey finish. LUMICLAD ® black oxide for aluminum. 30 minute process operates at 200 o F and creates a satin black finish. accuracy and ensuring the gear's diameter is in precise relation to its pitch line. In addition to the improved precision, the workholding improved repeatability and gear cylindricity. The chuck works on a BT-style collet princi- ple: a bayonet-style mounting system similar to mounts for camera lenses. The chuck's collets are longer and have two points of sup- port: the taper for accuracy and the back face for parallelism. For holding gears, the collets have a gear tooth pattern. With air sensing, the chucks can detect if a workpiece is seated improperly and, in those instances, will alert the machine controller. "We must have an extremely accurate collet chuck, one in which we are able to load a gear, make the first cut, inspect it and produce a per- fect part," Mr. Quek says. 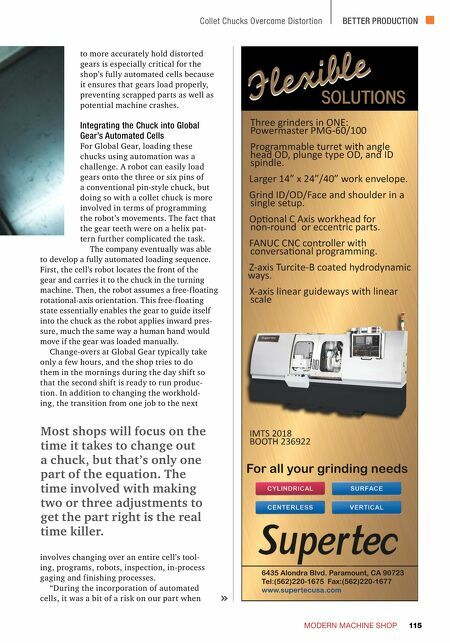 "Most shops will focus on the time it takes to change out a chuck, but that's only one part of the equation. The time involved with making two or three adjustments to get the part right is the real time killer." Clamping on every tooth as the KZF-S does elim- inates such variations and discrepancies, essen- tially taking an average of all the teeth locations and avoiding inspection errors. The ability The KZF-S collet chuck, shown here, provides even gripping around the circumference of the gear teeth, ensuring that minor distortions in the gear teeth neither offset the workpiece (resulting in inaccurate in-process inspection) nor prolong the setup time. The chuck is designed for quick changes to accommodate different workpieces.